This photograph was chosen as picture of the month by Astronimía magazine! Solar eclipses have always awed humanity, which generally took them as one of the most vivid and fearsome manifestations of the gods. And no wonder. Science, and the knowledge it brought, have allowed us to get rid of superstition and enjoy solar eclipses for what they truly are: one of the most fascinating natural phenomena on Earth. See something peculiar? Those are some pretty big numbers there, so I guess not. But do the math and you will find that the distance to the Sun is 400 times the distance from here to the Moon and, here is the trick, the size of the Sun is also 400 times the size of the Moon. What does all this mean? From our perspective the Moon and the Sun have an almost identical size in the sky, so the Moon can nicely cover the Sun whenever they cross paths. And this should not be taken for granted. In fact, it is a situation exclusive to the Earth and this time in the Solar System. All other Moons are either to close to be a close fit or too far to cover the Sun completely. And I also said “exclusive to this time”. This is true. When the Moon was formed a long time ago—a consequence of a big impact to the young Earth—it was a lot closer to the Earth than it is now. It would have looked noticeably bigger than the Sun in the sky. But there is a complicated process going on, called tidal locking. This is the reason why we can see only one face of the Moon and also why the Moon is slowly getting farther away from us, so in due time there will be no more total solar eclipses. But we need not travel to the future to see that. When I said the distance to the Sun is 400 times the distance to the Moon I lied. It actually depends on whether the Moon is closer or farther from us in its orbit: the Sun is really from 368 to 412 times farther from the Earth than the Moon. In the first case, when the Moon is smaller in the sky, it will not be able to completely cover the Sun; we call that an annular eclipse, because the Sun looks like a bright ring during the maximum of the eclipse. (Annulus is Latin for ring.) 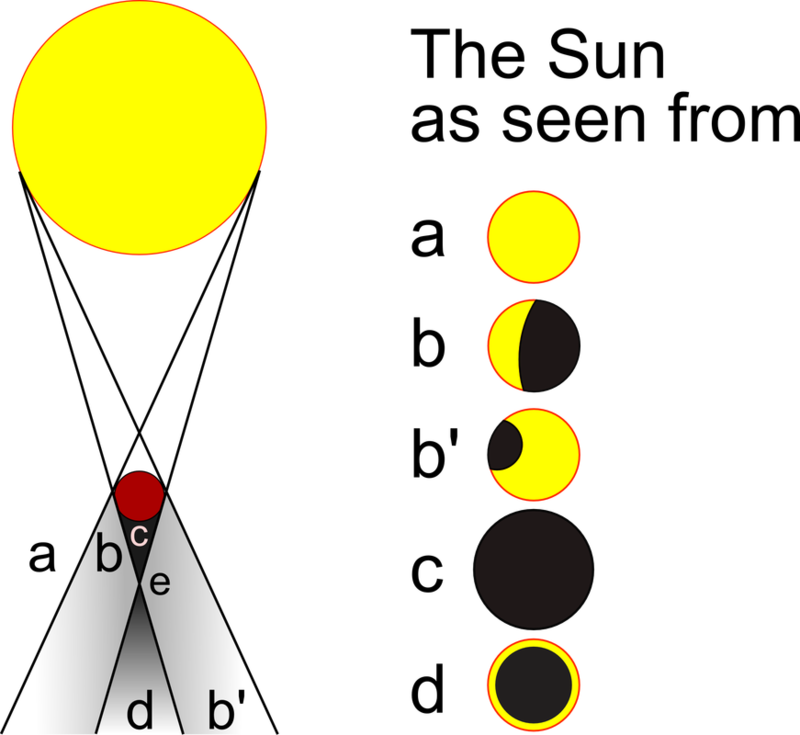 In the picture above that corresponds to the situation in d. If the Moon is at least as big as the Sun in the sky, then a total eclipse will happen. This is what we see in c.
As always when we talk about the Sun, a warning is due. Remember that safety comes first when observing the Sun, specially if you use binoculars or a telescope… and no, eclipses are no exception. The only, only, time you may ever look directly at the Sun is during the few seconds of totality, but that's it. Otherwise you can get blind in an instant, and it won't even hurt. More on safety and observing tips in the Sun page, or in this link here. 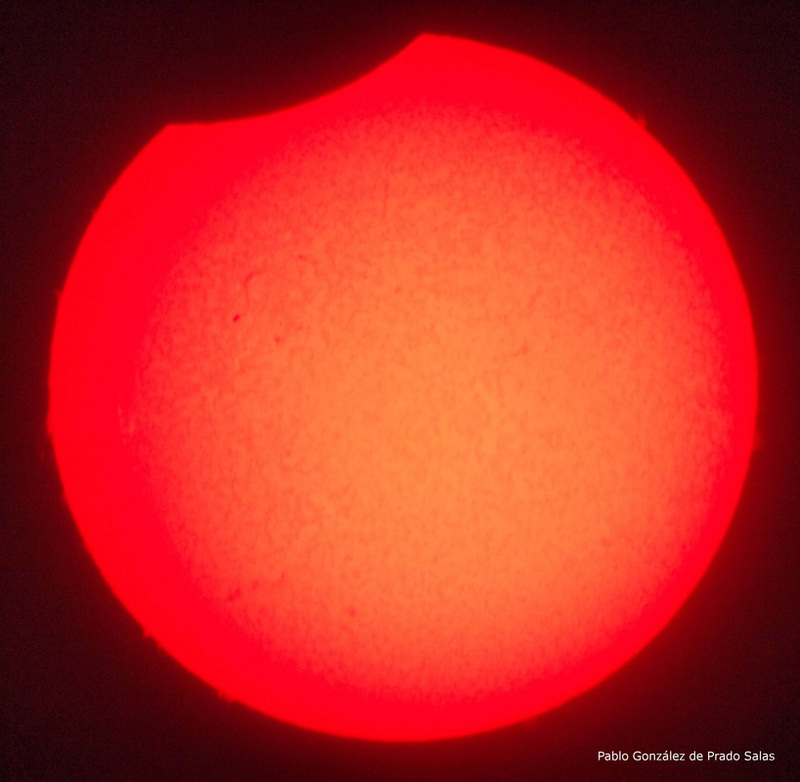 If you are interested in witnessing a solar eclipse—and you should—you may start by checking the NASA solar eclipse website, where you will find all the information you need about eclipses. And then some. Taking pictures of an eclipse is just like taking pictures of the Sun. However, the totality can be more tricky. This is because the Sun and everything around you will become very dark, and only the solar corona will glow. But the auto exposure of modern cameras is getting quite clever, so you may be lucky. The image at the beginning of this page was taken during the total eclipse in Argentina in 2010, and everything was set to auto as far as I remember—I didn't even have a tripod!—Of course other pictures were out of focus or with a weird exposure, but a few came just right. My advice is think ahead and practice all you want, but when the moment comes don't sweat it: it is enjoying the event that counts, and it will be so short. If you have a tripod or a telescope I suggest you set the focus to manual (and evaluate it during the easier and long partial phase not to be touched again) and then try auto exposure with bracketing, a feature in many cameras that will take several pictures with different exposure values around the calculated optimal value. Think less, enjoy more. And don't forget to appreciate your surroundings! 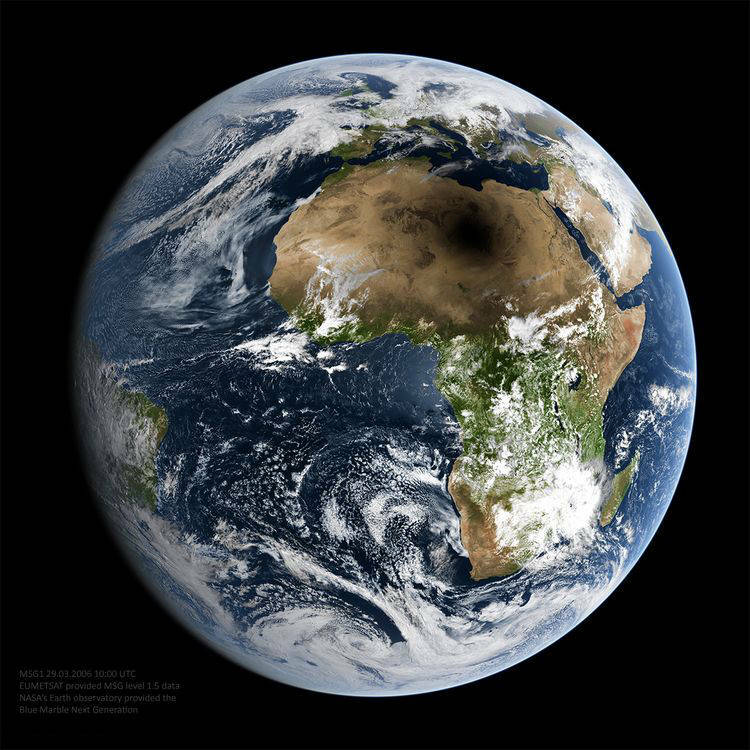 Pictures with some con­text around the eclipsed Sun can be more powerful, but do not try ma­ny things during one eclipse, because it will really be short and you don't want to miss it. Here you have the links to the eclipses I have witnessed and tried to photograph with different luck. But take my word: even if you are not so much into astronomy, a total eclipse will not disappoint you or anyone you take with you. Even if it is cloudy as London.